As a principal, it’s clear to me that I need to be data informed. My job depends on it—literally, since I am evaluated by my school’s achievement. More importantly, though, my heart depends on it—I am committed to seeing data not as just numbers, but connected to the success of the students and teachers in my school. As the school’s leader, my thoughts turn to the best way to translate my own state of “data informed-ness” into meaningful action, and I have come to understand the key lies in putting my efforts into creating data leaders beyond the principal’s office. My Using Data colleagues are now in every classroom in my school! Accomplishing this level of a “using data school culture” depends on a process that involves professional development, support, and dedication over time. We work at it every day.This journey started when I selectively invited third, fourth, and fifth grade teachers who were naturally analytical and collaborative to form a Data Team. As a small team, we shared a common vision and passion to create a culture where data would drive instructional practice and result in student improved student achievement. Our vision focused on a commitment to collaborative inquiry. We use a process called data driven dialogue to analyze data together, versus individual teachers looking at their own data in isolation. This process has helped us to uncover critical student learning problems—some of which we discovered were systemic. For example, are the standards for mastering fractions only challenging at the fourth grade level, at which time they are specifically tested and we see deficiencies? Or is there a vertical trend in this unit of study? What happens within our Data Team work is magical. I have become just another member of the team. As principal, I am not the facilitator, but instead, an equal contributor and participant in our growing school data culture. True ownership and connections have evolved to the point where team roles have become fluid. Our team meetings always include a recorder, but no single designated facilitator. Instead, we start each meeting with a specific goal/focus. Based on related teaching experience, passion for the topic, and content knowledge, different members take the lead as different times. This initial vertical Data Team of third through fifth grade teachers meets monthly to analyze aggregate and disaggregate state, district, and school data. We look for patterns and trends and then drill down through strand and specific item data, including student work samples. This approach allows data analysis to inform us on a non-personal level, and the data is intended to inform our practice, never to find fault. As we analyze data together, our ultimate goal is to create a plan to address a student-learning problem that team members agree on because it is backed up by multiple data sources. We set a target goal and devise action steps to achieve it. Following each meeting, team members return to their grade levels to report our findings and discuss next steps. Together, the teachers own the problems AND the solutions. Once this initial Data Team was well established, I wanted to roll out the same process in kindergarten through grade 2. I met with the lower grade levels during their common planning time to demonstrate the same protocols the upper grades use. I discovered that flexibility was key to success, since my primary teachers had less exposure to formal data analysis than the upper-level teachers. Historically, they rely instead on informal observations, rubrics, and limited formal assessment data. I found I had to differentiate and scaffold the process for each grade level—just like for students with different learning styles in a classroom. It has been almost two years since my school’s Using Data initiative began. In addition to the collaborations I’ve already mentioned, we currently hold vertical content meetings (K-5) each month. This is another scheduled opportunity for teachers to talk about and analyze data, and collaboratively look for trends in student learning problems and their solutions across grade levels. 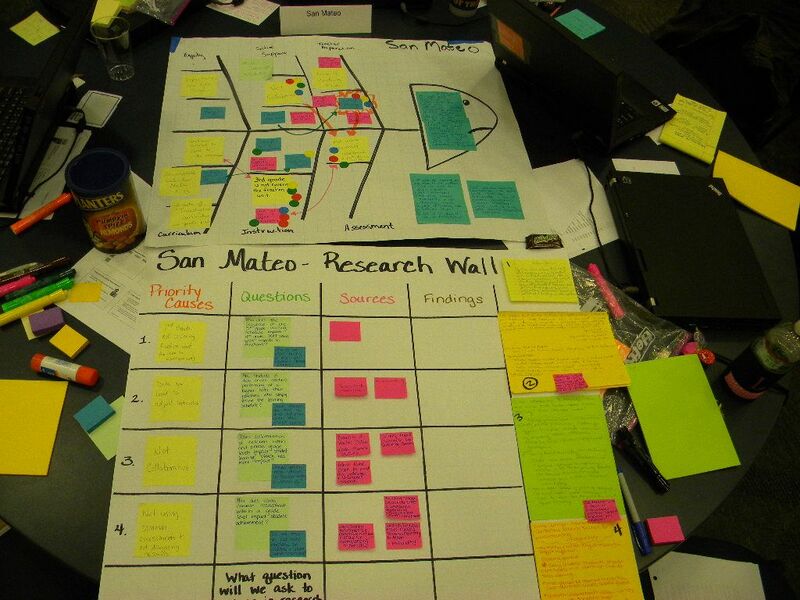 This dedication to process and devoting time to regular collaborative inquiry has led to a growing data-driven school improvement culture at San Mateo Elementary. In future posts, I will guide you through my journey of going even farther with data. I’ll share our experience of extending this process to involve students with goal setting and then holding student-led Family Data Nights. I’ll share how the triangulation of data, grades, and student work has created a deeper dialogue with families and our support staff—leading to increased student growth as a result of more targeted RtI (Response to Intervention) strategies and safety nets. I’ll also expose our two-year process to create and protect true collaborative inquiry and planning time and the impact this journey has had on content-driven professional development. San Mateo Elementary School was one of 30 treatment schools that participated in an IES grant to study the effectiveness of TERC’s Using Data model and protocols during the 2012-2014 school years. Amazing work you are doing at San Mateo! You are such a great example for others to follow. Thank you for sharing your process. I am looking forward to future posts. It’s great to see a principal so dedicated to measuring data (outside of test scores). Establishing the collaboration needed to maintain a data-driven school environment requires trust and continued communication. Kudos!